Good news on Korean film rookies in the international stage. 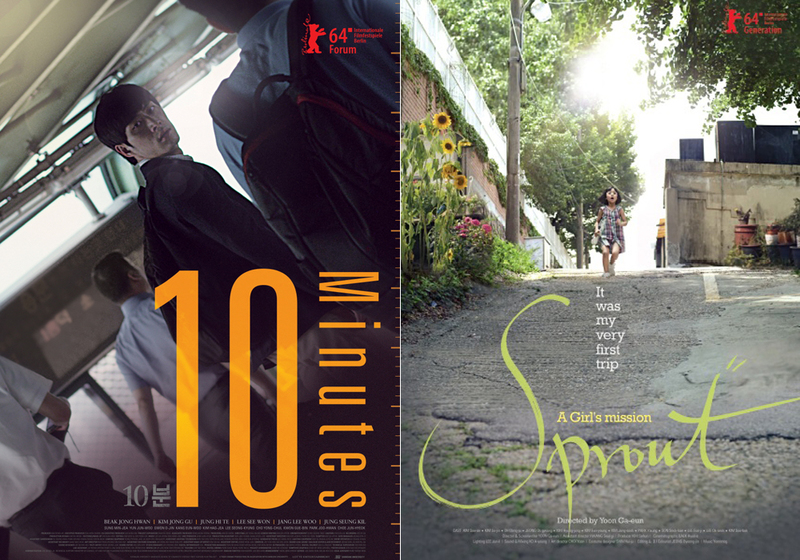 LEE Yong-seung of Ten Minutes and Yoon Ga-eun of Sprout have been receiving awards in many renowned international film festivals. LEE made his film debut with 10 Minutes which was soon invited to the New Currents section in the 18th BIFF and received the KNN Audience Award and the International Federation of Film Critics Award. Later in the 64th Berlin International Film Festival it was invited to the Forum section and at the 20th Vesoul International film festival of Asian cinema, received Cyclo d’Or which is the grand prize, becoming the center of attention in the international film milieu. Also, Yoon introduced her short film Sprout at BIFF last year in the Wide Angle section of Korean shorts competition and earned a special mention at Sunjae award and later received Chrystal Bear award in the Generation K-Plus section which is the winner of the best short. Here are short but impressive interviews of these two very promising young cineastes. 10 Minutes clearly and explicitly reveals the behind scenes of Korean youth’s career path today. A young man gets an internship at a job and is offered a regular position but soon bumps into an unexpected situation. The realistic description in the film was sympathetically received by many young viewers. - It is based on your own experience. In the film, I wanted to describe the atmosphere that I felt when I worked at a temporary position at a government run company. Of course the details are not exactly the same but I wanted to tell the story of what I really do understand and know well. That is the most comfortable way for me to make a film. - What is the message that you wanted to deliver through 10 Minutes? Korean youth are often referred as “the 880,000 won generation”, named after their very low average income as a part-timer. Their biggest characteristic is that they feel shrunk and depressed. Why? That’s because they have no other choice. They are forced to choose to be a member of the 880,000 won generation. I wanted to depict their disappointment and depression. In my opinion, a good society is the one with a variety of choices for its members. I wanted to suggest such discussion by this film. - Why do you think 10 Minutes is warmly received in the international film festivals also? What 10 Minutes discusses is not limited within the Korean society. I have learned from international audiences that this problem is global. Especially I recall the high school students majoring art that I met at the Vesoul International film festival of Asian cinema, and they told me that they are going through exactly the same issues. They also need courage to choose their own dreams which is not easy for them in reality, and they were comforted by this film. - How do the Korean audience have access to 10 Minutes? It is to be released in Korea at the end of April, and it will be also screened at the Florence Korean Film Festival and Hong Kong International Film Festival. - Tell us about your next film. I am planning on a commercial feature film illustrating a love story in immigrant culture today. A young girl takes a very significant first step. She goes to the market all by herself to buy a bag of sprout and she encounters all kinds of temptations and dangers on the way. However, she would not stop her adventure. This short film is very attractive and lovely, but at the same time, never lets go of tension. - You received Chrystal Bear at Berlin International Film Festival. It came totally unexpected. I found out much later that it was the grand prize for the short film. It was especially meaningful for me because this award is selected by the children and youth jury. Eleven German teenagers went through discussions and decided on this film. It is a film featuring children, and it is loved by children! I can’t be any more grateful than this. - Sprout is an adventure story of growing up, with a touch of fantasy. How did it all begin? I always liked the adventure genre, but there are very few films featuring a young girl as the main character, so I wanted to have a go. My mom once told me about the day when I was running errands for the first time. She was a little worried so she secretly followed me. It turned out, I stepped in unfamiliar routes a couple of times but finally made it. Based on this story, I added the ongoing issues of my own. I often ended up at wrong places although I tried very hard. I had such moments especially when I started making films. However, I wanted to show that the first step and the very fact that you are going somewhere are already very meaningful. - The performance of KIM Su-an, playing the main role, is outstanding. This is an amazing and charming girl beyond expression. I saw her for the first time in PARK Heung-shik’s My Sibling, and when I was preparing for Sprout, my assistant director recommended her for the main character. At the audition, I was totally attracted by her smart, mature yet very child-like simple personality. At shooting, I tried to create the situation as realistic as possible and let her respond. For example, when she had to fight against an elder girl, I made them really fight. I know she could have been clueless and sometimes scared during shooting, but she never gave up and kept following. She has an incredible ability of concentration. - The space in the film shows less known features of the city of Seoul. I like traveling through small routes and taking pictures, so I had places in my mind. I shot at those places for this film. They are the kind of places where you wonder ‘is it really part of Seoul?’ The aged places are fast disappearing, which makes me all the more want to keep them in the frame. On the other hand, it breaks my heart when these aged routes and places are often featured as the stage for crime. I wanted to feature them as a space where exciting adventures, acts of kindness and little miracles may happen.